There are thirteen imperial tombs of the Ming Dynasty scattered over an area of forty square kilometers in ChangpingÂ District to the northwest of Beijing. Construction of the necropolis spanned more than two hundred years, almost throughout the entire Ming Dynasty: The first tomb was built in 1409, and the last one in 1644. 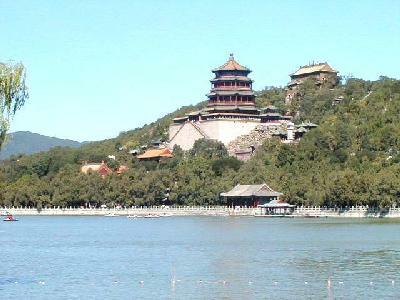 There is the magnificent Yanshan Mountain, running from west to east, encircling the Ming tombs on three sides. The thirteen Ming Dynasty imperial tombs are Changling of Emperor Cheng Zu (Zhu Di), Xianling of Emperor Ren Zong (Zhu Gaozhi), Jingling of Emperor Xuan Zong (Zhu Zhanji), Yuling of Emperor Ying Zong (Zhu Qizhen), Maoling of Emperor Xian Zong (Zhu Jianshen), Tailing of Emperor Xiao Zong (Zhu Youtang), Kangling of Emperor Wu Zong (Zhu Houzhao), Yongling of Emperor Shi Zong (Zhu Houzong), Zhaoling of Emperor Mu Zong (Zhu Zaihou), Dingling of Emperor Shen Zong (Zhu Yijun), Qingling of Emperor Guang Zong (Zhu Changluo), Deling of Emperor Xi Zong (Zhu Youjiao) and Siling of Emperor Si Zong (Zhu Youjian). The Ming Dynasty was founded by Zhu Yuanzhang, who made Nanjing his capital, under the reign title of Hong Wu. He was on the throne for thirty-one years and was buried in Xiaoling in Nanjing after his death. The second emperor was Zhu Yunwen, Zhu Yuanzhang's grandson, whose reign title was Jian Wen during the four years he was on the throne. Zhu Yunwen's uncle, Zhu Di, the Prince of Yan, who was in Beijing at that time, sent troops southward to seize the throne for himself. After a war of several years, Zhu 135 finally occupied the Ming capital of Nanjing and became emperor. As Zhu Di occupied Nanjing, the palace was ablaze and Emperor Jian Wen (Zhu Yunwen) disappeared without a trace. Some say he burned himself, others say he became a monk. Still, no one knows. After Emperor Cheng Zu (Zhu Di) ascended to the throne in Nanjing, he changed his reign title to Yong Le. Staying in Beijing for many years, he had taught Emperor Zhu Di the strategic, military importance of what is now China's capital dh7. In the 4th year of the Yong Le reign (1406), one million laborers were sent to begin building projects in Beijing. In the 5th year of the Yongle reign, Empress Xu died. Since Emperor Zhu Di did not plan to build a mausoleum in Nanjing, he sent Zhao Yu, a high official, Liao Junqing, a diviner, and other people north to choose auspicious sites for imperial burial grounds. In the 7th year of the Yong Le reign (1409), the burial grounds were selected. Emperor Zhu Di, in visiting the place himself, found a vast area with good soil and ringed by hills. Zhu Di, gratified that his diviners found the signs for this location agreeable, ordered forty square kilometers in this area dedicated to the necropolis. Thus construction of the Changling Mausoleum began. The area chosen as an auspicious site for the imperial burial grounds was not only beautiful of scenery, but also in an excellent position from a military perspective as the mountains provided a natural defense for the area, as well as for the capital. Changling, built by Emperor Zhu Di at the foot of Tianshou Mountain in the northern part of present Changping County, was the first imperial tomb in this area. The last tomb (Siling) was built during the reign of Chong Zhen (the last emperor of Ming). Thirteen of sixteen Ming emperors were buffed there, except for Emperor Jing Tai, who was buffed in the western suburb of Beijing. Therefore, the huge complex is known in Chinese as Thirteen Ming Tombs. Generally speaking, the scale and grandeur of imperial mausoleums depend on seniority in imperial families. The scale of the ancestral mausoleums must be larger than for descendants. The Thirteen Ming Tombs, however, did not follow that rule. Some imperial tombs for descendants are larger than those of their ancestors. After Zhu Yuanzhang, the first emperor of Ming, died, he was buried in Xiaoling in Nanjing. His son, Emperor Zhu Di, the emperor who consolidated the reign of Ming, was buried in Changling in Beijing. 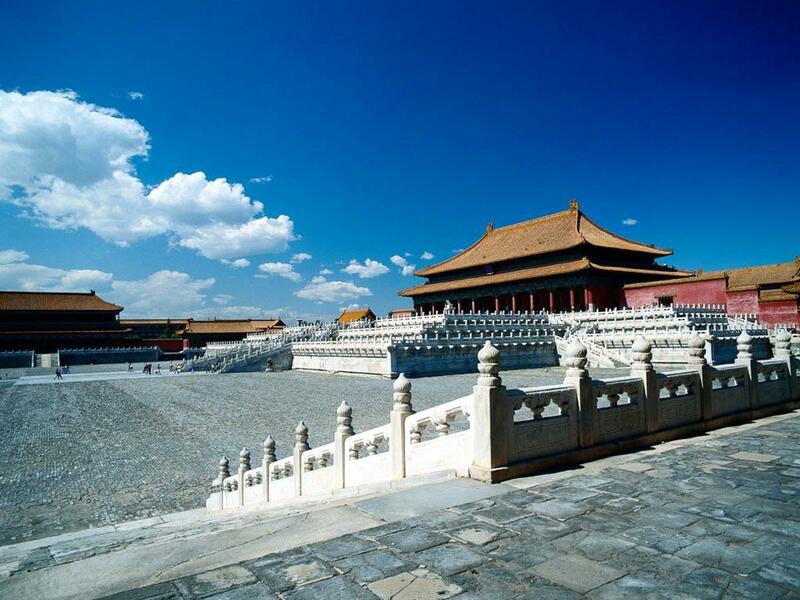 The tombs of Emperor Zhu Yuanzhang and Emperor Zhu Di were both built on a grand scale. Later some imperial tombs of descendants also reached that scale, as a tomb built during an emperor's lifetime generally was on the grand scale since tomb construction was supervised by the emperor. Thus, all the buildings of living emperors' mausoleums were likely to be tall and magnificent. In most cases, a mausoleum built by descendants was smaller in scale, with the buildings roughly built. Emperor Ren Zong, the first son of Emperor Zhu Di, was on the throne for only one year followed by Emperor Xuan Zong, the first grandson of Zhu Di, who reigned for ten years. In history, of course, this period was called the reigns of Emperor Ren Zong and Emperor Xuan Zong. mausoleum should be roughly built." After Emperor Ren Zong died, Emperor Xuan Zong, acting on his father's testament, decided the scale of Xianling. Emperor Xuan Zong built his own Jingling mausoleum during his lifetime, but the scale of Jingling was smaller than that of Xianling. The book Changping's Mountains and Rivers says, "Xianling was constructed on a small scale; Jingling was even smaller than Xianling." From the foundation remains of the Soul Tower and high, castle-like walls, the scale of the two mausoleums can still be seen. They were both most simply built. After the reign of Emperor Xuan Zong, all succeeding emperors were raised in the palace in Beijing. They seldom left their palaces, therefore they knew nothing about how difficult it was to establish and exercise power. They led dissipated lives, did not care much about affairs of state, and were accustomed to the flatteries of officials, though they often refused to listen to sincere advice offered. They lived in luxury and spent money like water. According to burial rules and customs during the early Ming, an imperial mausoleum was for the emperor and the empress. But, after Emperor Ying Zong died, he and his two consorts were buried in Yuling. Later, after Emperor Xian Zong died, he and his three consorts were buried in Maoling. The burial rules and customs had been broken. This suggests the decadent politics of the middle Ming and illustrates that emperors led dissipated lives. After Kangling of Emperor Wu Zong, there were Yongling of Emperor Shi Zong, Zhaoling of Emperor Mu Zong, Dingling of Emperor Shen Zong, Deling of Emperor Xi Zong and Siling of Emperor Shi Zong. During this period, politics were more decadent and life in the palace was more luxurious. Some mausoleums built during this period were very magnificent. The representative ones are Yongling and Dingling. Zhaoling and Deling were built after the emperors died, so the scale of their mausoleums was small. The two mausoleums, Qingling and Siling, were built for others, but Emperor Guang Zong and Emperor Si Zong were later buried there. The Thirteen Ming Tombs in Beijing and Xiaoling Mausoleum in Nanjing have similar layouts and construction. 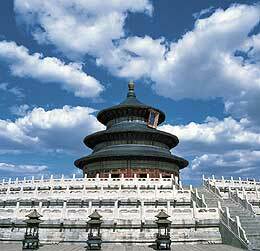 The spirit path stretches seven kilometers from south to north across the center of the site to symbolize the dignity of the emperors. In front of the mausoleum gate is huge marble archway, built in the 19th year of the Jia Jing reign (1540). The marble archway, though built some 450 years ago, is still in excellent condition. It is twenty-nine meters wide, supported by six marble pillars and has five arches. The massive pedestals are decorated with relief carvings of dragons and clouds, and on top of each pedestal squats a stone animal. The archway was built with massive white marble, and the vivid and exquisite archway carving was rarely seen during the Ming and Qing dynasties. One kilometer from the archway is the main Great Palace Gate, which faces south and has three passage ways, vermilion walls and a yellow glazed-tile roof. There are tablets on each side of the gate to enjoin "officials and others dismount here." Prohibitions relating to the protection of Ming imperial tombs were many and varied, including a whipping for anyone found collecting wood or breaking off twigs in the tombs area, execution for anyone found removing stones or soil, and a hundred lashes with a stick for anyone entering without official permission. Anyone entering the area, whether official or citizen, outsider or guard, was required to dismount a hundred paces before the gate on pain of punishment for disrespect. Great Palace Gate stands between two hills, Mangshan (Python Hill) on the east and Huyudan (Tiger Gorge Hill) to the west. All the emperors were superstitious and were especially keen on practicing geomancy when they chose burial grounds. Python meant dragon and Tiger Gorge referred to white tigers. There is an old saying, "A dragon on the left and a white tiger on the right." The two hills (a dragon and a tiger) were like two guards beside the mausoleum gate, making it dear that the location of the Great Palace Gate was carefully determined. A wall built along the mountains surrounding the tombs was forty kilometers long. Along it were ten gateways (Zhongshan, Dongshan, Laojuntang, Xianzhuang, Hulling, Zhuishi, Yanzi, Desheng, Xishan and Zhazi), each with a fortress guarded by imperial troops. Most of the wall and buildings have collapsed but remains can still be seen here and there, giving some idea of the splendid architecture. Some distance inside the gate is the tablet pavilion with a double eave roof and white stone ornamental pillars at each of the four corners. The four stone ornamental pillars, decorated with relief carvings, are similar in size and design to those in front of Tian'anmen Gate tower in Beijing. 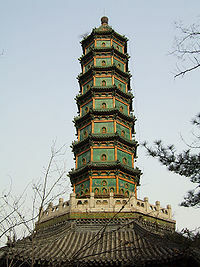 Inside the pavilion is a tall stele, about 6.5 meters high, built for Emperor Cheng Zu. The front of the tablet bears a 3,000-word inscription in the hand of Emperor Ren Zong. The tablet was named 'Tablet of the Divine Merit and Sage Virtue of Changling of the Great Ming." On the reverse is inscribed a poem by Emperor Qian Long of the Qing Dynasty. Inscriptions on two sides of the tablet talk of renovation of the Ming tombs by emperors Qian Long and Jia Qing of the Qing Dynasty. The stele rests on the back of a huge stone tortoise. A fairy tale says, "The dragon had nine sons, one of them was a tortoise, each having its own interest and special skill. Known for its powerful physique for carrying a heavy load and its longevity, the tortoise was regarded highly by people. In slave societies, slave owners used tortoise shells to practice divination because tortoise lived a long life and therefore must know many things. Slave owners would bum tortoise shells and find good or ill luck according to cracks in the charred shells, inscribing results of the divination on the tortoise shells." This was the wisdom of three thousand years ago. According to the book Rites of the ZhouDynasty (1027 B.C.-256), there were, at that time, guiren, officials specially assigned to care of tortoises. During memorial ceremonies, they would tend six tortoises. In the Han Dynasty, handles of gold seals used by dukes were carved into tortoise shapes. After Wu Zetian took the throne, she ordered that fish shaped bags used by officials should be changed into tortoise shaped bags. In feudal society, the scarlet bird, the xuanwu(tortoise), the bule dragon and the white tiger were four divinities. Xuanwu was the embodiment of the tortoise. In the Forbidden City (the former palace of Ming and Qing dynasties), in front of Taihedian (Hall of Great Harmony), two bronze tortoises gilded with gold are still in excellent condition. Thus, it can be seen that the tortoise was highly respected by ancient people. It was then logical for the stele to rest on the back of a stone tortoise in the mausoleum because all emperors called themselves dragons and sons of the Heaven. The tortoise was one of the sons of the dragon, so it was reasonable to have a son do something for his father. Tall steles in the mausoleums were usually a dozen meters high. No ancient Chinese books tell how the stele was lifted to the tortoise's back, but a Japanese book records a legend about the stele and the tortoise. It says that as Emperor Cheng Zu was building a stele for his father Zhu Yuanzhang's mausoleum, workers found it difficult to put the stele on the back of the huge stone tortoise. 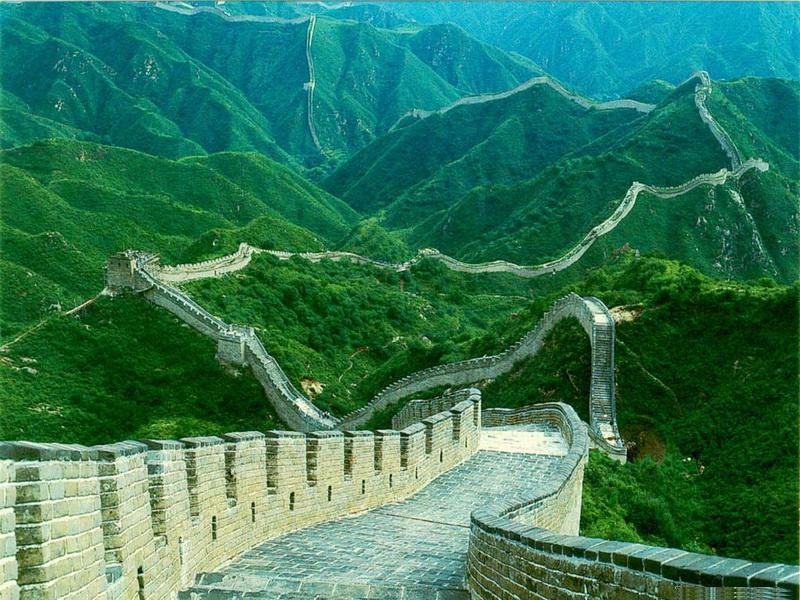 Those in charge of construction worried very much, but one night, Emperor Cheng Zu had a dream. An immortal said to him: "If you want to install the stele, the stone tortoise must not see the stele and the stele must not see the stone tortoise." After he woke up, he thought about what he had dreamt. Knowing the meaning of what the immortal had told him, he went to the construction site and told the workers to cover the stone tortoise with soil. They then pulled the stele up along the earth slope. When the stele was upright and in position they removed the soil. It is only a legend, but it is reasonable that the steles in the Thirteen Ming Tombs might have been erected by this method. It demonstrates the great intelligence of the laboring people of ancient times. Inscribed steles were erected in front of the tombs usually to extol emperor's merits and virtues. But no inscriptions are on the steles in the front of the Thirteen Ming Tombs. There are a variety of different explanations. Some say the merits and virtues of the emperors were too great, difficult for people to write down. The book The ImperialMausoleums records Emperor Zhu Yuanzhang's words: "There are some flatteries in inscriptions written by officials. They cannot be used to exhort later generations." After the officials in the imperial academy heard this, no one would write inscriptions for the mausoleum. From then on, successors to the emperors shouldered the responsibility for writing inscriptions. Why, then, did they not write any inscriptions? According to the True Account of the ShiZong Period, construction of the steles and pavilions in Changling, Xianling, Jingling, Yuling, Maoling, Tailing and Kangling began in the 15th year of the Jia Jing reign of the Ming Dynasty, lasting six years. Yan Song, a high-ranking official asked Emperor Shi Zong to write inscriptions for steles of the seven mausoleums. But Emperor Shi Zong was a man infatuated with wine and women, and not interested in writing inscriptions for the steles. Thus, there are no inscriptions on the steles in the seven mausoleums, setting a precedent followed by all the successors. Beyond the stele pavilion is an 8,000-meter-long spirit path. Along both sides of the path are stone animals and stone human figures. The procession starts with four lions, four xiezhai (mythical beasts with a single horn), four elephants, four qilin and four horses. In each group one pair is standing and the other kneeling. The human figures are four military officials, four civil officials and four meritorious officials. The stone figures are heroically shaped and graphically carved. The big statues are each carved from a single piece of white marble and are wonderful ancient art objects. All these stone carvings were the works in the early Ming Dynasty built more than five hundred and forty years ago. The practice of placing stone animals and human figures in front of imperial tombs can be traced back at least to the Qin Dynasty some two thousand years ago as each dynasty has followed the custom, though varieties and numbers of stone animals and stone figures differ by dynasty. In the Qing Dynasty, such stone animals as qilin, pixie (exotic animal with horns), elephants and horses were placed in front of the tombs. In the Tang Dynasty, lions, horses, oxen, black birds and stone figures of civil officials and warriors were favored. In the Northern Song Dynasty, stone animals --elephants, horses, sheep, tigers, lions, black birds, and stone figures of civil officials and military officials also were lined in front of imperial tombs. The placing of stone animals and human figures in the Thirteen Ming Tombs in Beijing almost followed the pattern of Xiaoling. In ancient time, stone animals and human figures placed before imperial tombs symbolized royal power and privilege in addition to their decorative functions. Stone lions not only were placed before imperial tombs, but also in front of yamen (a government office in feudal China). Lions are ferocious animals roaring aloud. Buddhist scripture says, "All animals will be in great panic at the approaching of a roaring lion. 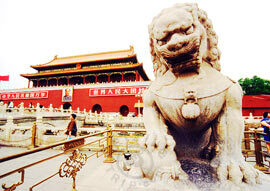 Stone lions are placed before imperial tombs in order to avoid evil influence." Xiezhai were mythical, single-horned beasts which attacked bad people. In ancient time, judges liked to wear hats made in xiezhai shape, symbolizing an ability to differentiate between evil and good. Camels and elephants were important means of transport in desert areas and tropical zones and qilinsymbolized auspicious events. In ancient times, the qilin, phoenix, fish and dragon were regarded as four important spirits. Horses in good temper were good at running. 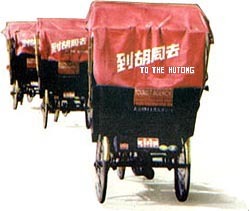 Thus, in ancient time, horses were very important for transportation in people's daily life. Qilin, xiezhai, horses and lions symbolized royal power and privilege. The stone human figure was called Weng Zhong. It was said that in Qin Dynasty, a military official named Ruan Wengzhong was a tall man of great strength sent to guard Lintao (present Minxian County, Gansu Province) where he rendered outstanding service against the Xiongnu (Hun), an ancient ethnic group in China. After he died, Emperor Qin Shi Huang built a bronze statue of Ruan Wengzhong in commemoration. It was placed in Xianyang Palace and from then on, bronze or stone statues of humans were called Weng Zhong. The stone human figures of civil officials and meritorious officials placed before the tombs symbolized real civil and military officials guarding the tombs. At the end of the sculpture avenue is the Lattice Gate, also called the Dragon and Phoenix Gate, consisting of three parallel small archways. Over the archways are stone carved sparks for decoration. At the end of the spirit path is a Seven-Arch Stone Bridge, followed by a zigzag path to Changling tomb. The spirit path built in Changling times later became the pathway of the entire Ming necropolis because it connected with other Ming tombs. This is one of the characteristics of the Ming tombs. The Thirteen Ming Tombs were all built in the Ming necropolis. Every mausoleum has architectural characteristics of its own though each was built at the foot of a mountain. The layout of each mausoleum is different, but the thirteen tombs still have nearly the same general arrangements. Each mausoleum, called a "palace," is surrounded by vermilion walls. Through each "palace" gate is the Gate of Prominent Favor leading to the Hall of Prominent Favour where sacrifices were offered by emperors, empresses and officials to the deceased emperors. Of all the Ming tombs, only the Hall of Prominent Favor in Changling is still in excellent condition. The hall was constructed throughout of nanmu (a fine hard-wood). Each large supporting pillar was made of a single trunk. The pillars are so large they take three people to encircle hand in hand. This kind of large nanmu is rarely seen in China. Behind the Hall of Prominent Favor is tomb mound within high castle-like walls, created by piling yellow earth, where the emperor and empress were buried. In front of the castle-like wails stands a small building known as Minglou ( Soul Tower), containing at its center a stele inscribed with the posthumous title of the emperor. 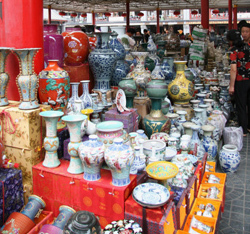 In front of the Soul Tower is a set of five glazed pottery altar pieces, consisting of two candlesticks, two beakers and an incense burner. Every mausoleum had special areas near the mausoleum called jian, yuan and wei. Jian was the residence area for officials and eunuchs who were in charge of the offering of sacrifices to the deceased emperor. These areas have become residential grounds for peasants. Yuan were for the gardeners who supplied vegetables and fruits for offering as sacrifices to the deceased emperor. Wei was for the guards who defended the mausoleum. All halls in the Ming tombs were built with nanmu. The timber came from the mountains in Yuannan, Guizhou, Sichuan and other provinces in southwest China. In the Ming Dynasty, special groups were sent to the south to collect nanmu, called imperial timber, for construction of imperial palaces and mausoleums. This kind of tree grew deep in the mountains where searchers had to walk in groups among the dangerous, uninhabited mountain slopes where wild beasts would attack and where diseases struck. These parties braved wind and rain and suffered from cold and hunger and many lumbermen died in these mountains in pursuit of nanmu. "One thousand people went to the mountains, but only five hundred came back" is a saying vividly describing the fate of the lumbering expeditions. The thinks were so big it was difficult to carry them on the rugged mountain paths. The lumbermen had to await the rainy season when torrents of water rushing down the mountain could wash the big tree trunks down and into the open. Then the timber would be carded to a river. It took five to six years to transport these logs to Beijing. Even on the river, as lumbermen shepherded the timber, they were often engulfed by terrifying waves. Again, many died along the way and much timber was lost. Bricks used in Ming Tombs were also special. Each brick weighted about 25 kilograms with the word shou (longevity) imprinted. Before the Jia Jing reign, the bricks were provided by local kilns in Beijing. Later, most of the bricks were transported from Linqing, Shandong. The Imperial Construction Office sent specialists there to arrange manufacture of the bricks. One million bricks were required each year, each of good quality, solid and smooth and emitting a clear tone when struck. The names of brick manufacturers and officials put in charge were printed on every brick for later check. Large quantifies of stone were also used during construction of the Thirteen Ming Tombs. Black stone and doucha stone were used to pave the path and build foundations for walls, bridges and wharves. The stones were from Beijing suburbs. White marble is as white as snow and as fine and smooth as jade, and is especially suitable for carving. The massive white marble door of the underground palace in the Dingling was carved from a single stone. This type of white marble came from Dashiwu, a Beijing suburb. The figured stones are very solid. Different patterns become visible as the stones are polished. The myriad patterns are very beautiful. The floor of the rare hall of the underground palace in the Dingling was paved with such patterned stone. The stone animals, stele, tortoise and corner columns were each carved from single pieces of stone. At that time it was very difficult to transport these big stones, not to mention all the difficulties of quarrying. Between the quarries and the mausoleums many wells were dug so that during severe winter weather coolies had water to pour on the ground. Once the ground was frozen, a special wooden frame (land boat) holding a big stone would be pulled along the icy strip by one thousand people, moving the boat a step at a time. The book True Account of the Winter Palace, says, "In order to build the Tablet of Divine Merit and Sage Virtue, twenty thousand coolies from eight prefectures were sent to move the huge white marble, which is 9.9 meters high, 3.3 meters wide and 1.6 meters thick. The huge marble took twenty-eight days to transport to Beijing. It cost 5,500 kilograms of silver." In feudal societies, imperial tombs were tightly sealed because emperors feared grave robbers; such sealed tombs also made excavations difficult for modern researchers. Therefore, there are many mythological stories about the underground palace. To reveal the secrets of the under-ground palace has been the research goal of many archaeologists. Chinese archaeologists began excavation of the underground palace in the Dingling in May, 1956. Because the Dingling is so large they really did not know how to start the work on such a huge project. However, they discovered that several layers of outer wall bricks had collapsed on the southeast side of the grave mound within high, castle-like walls. The gate of the arched passage could be seen from the broken wall. Later, some characters, such as "gate of the passage," "stone passage" and "left passage" were discovered on the inner side of the walls. These discoveries provided important leads for excavation of the Dingling. Based on these findings, the first step was to start from the inner side of the wall. A ditch, 3.5 metres wide and twenty metres long, was dug facing the gate of the arched passage. A brick passage way was found, suggesting this passage might lead to the underground palace. But the ditch was not long, so the whole passage could not be seen clearly. After further consultation among archaeologists, a zigzag passage leading to the back side of Minglou ( Soul Tower) was found. Thus the archaeologists decided to dig another ditch, ten meters wide and thirty meters long from the back side of the Soul Tower standing before the mound. When they had dug 7.5 meters below ground level, they found a small stone tablet with sixteen Chinese characters, telling that the distance from the tablet was sixteen zhang (nearly 53 meters) to the Jingang Wall and 3.5 zhang (11.5 meters) deep in the ground. This was the unexpected research bonus. Some guessed the small tablet was the key to opening the underground palace; others said it was a guide. The archaeologists, after further consideration of the small tablet, concluded that the tablet was a guide to finding the palace for the ancients. Dingling was built in 1590. Emperor Shen Zong and the empress were buried there in 1620. After it was built, the underground palace was covered with deep soil. The people in charge of the tomb construction and later burial of the imperials erected the tablet as a sign for relocating the underground palace when needed. Following guidance of the small tablet, a third ditch was dug in the western side and a stone passage sloping down from east to west was found, with a large wall at he end. Measurement from the small tablet to the wall showed the same distance as was inscribed on the tablet, leading to the conclusion that the Jingang Wall of the underground palace had been found. The Jingang Wall is 8.8 meters high with a roof of yellow glazed tiles. Careful inspection of the wall disclosed the dim shape of a door. Twenty-three layers of bricks across the front wall sealed the door. The bricks were moved out, revealing a square arched chamber, with an arched stone passage on its east side. In the center of the west wall of the arched passage, are two white marble doors, the entrance to the underground palace. The doors were tightly closed, and could not be pushed open because of a stone slab against the inside of the doors. To push the stone slab away without breaking it, archaeologists inserted a lead wire through the door crack to hook and hold the stone slab while the doors were pushed open. A wooden slab through the door crack then eased the stone from the door and, with great effort, the doors were pushed open. The stone slab had eleven Chinese characters inscribed: "The underground palace has seven doors." Each panel of the entrance doors is 3.3 meters high, 1.8 wide and weighs four tons. Nine lines of engraved knobs are on each huge door panel. The underground palace consists of five spacious halls: an antechamber, central hall, rear hall and left and right annexes. The vaulted halls are built of stone. A stone door stands between the antechamber and central hall. At the end of the central hall is the rear hall. On both sides of the central hall are tomb passages and stone doors opening to the left and right annexes. The underground palace occupies a total of 1,195 square meters. The vaulted halls are built of stone, without a single beam or column. To avoid damaging the marble floor, the surface from the antechamber to the rear hall was covered with thick planks for the hearse to roll on when it entered the underground palace, thick planks that can still be seen today. In the central hall are three white marble thrones, arranged with one in front and the other two on each side and slightly behind the first. In front of each throne is a set of five glazed pottery altar-pieces (consisting of two pricket candlesticks, two beakers and an incense burner), a blue-and-white porcelain jar of oil, and an "everlasting lamp," a bronze bowl with a wick, floating on its surface. The lamp was lit when the emperor was buried, but once the tomb was closed, the flame soon died for want of oxygen. The two annexes are similar to the antechamber and central hall. Each contains a white marble dais evidently intended for a coffin. The rear hall, the largest of the five chambers is the main part of the underground palace. At the center is a dais on which is placed the coffin of Emperor Shen Zong (Zhu Yijun), with the coffins containing the First Empress on his left and the Second Empress on his right. Each coffin was surrounded by pieces of jade, porcelain vases and twenty-six red lacquered wooden boxes filled with precious funeral objects. The archaeologists expected the remains would be enclosed in a wax coveting, but when the coffin containing Emperor Shen Zong was opened, only the unprotected skeleton was found, with the hair still in good condition. The hair was tied in a bun in which there were several gold hairpins, and some beard was still visible. The skeleton wore a gold crown, an imperial robe, a jade belt and boots. The emperor was not tall, one leg was a bit shorter than the other, and he was a hunch back.